All game presentation professionals are well aware that few games ever go exactly as planned. However, some sporting events fly much farther off the rails than others. Most game day mishaps are preventable or easily dealt with, but every once in a while a complete disaster arises. Check out this comprehensive list of the biggest game day mishaps caused by poor game presentation to prepare yourself for the worst curve balls that could come your way. In the Fall of 2017, an Oklahoma State home basketball game against Oral Roberts University was cut short at the end of the first half when the scoreboard and shot-clock failed, leaving the buzzer on full blast. After 19 minutes, the game presentation team could not find a solution, so PA announcer Larry Reece decided to step in. For the remainder of the game, Reece acted as a human shot clock and would shout out the time left on the shot clock when it hit the 10-second mark. 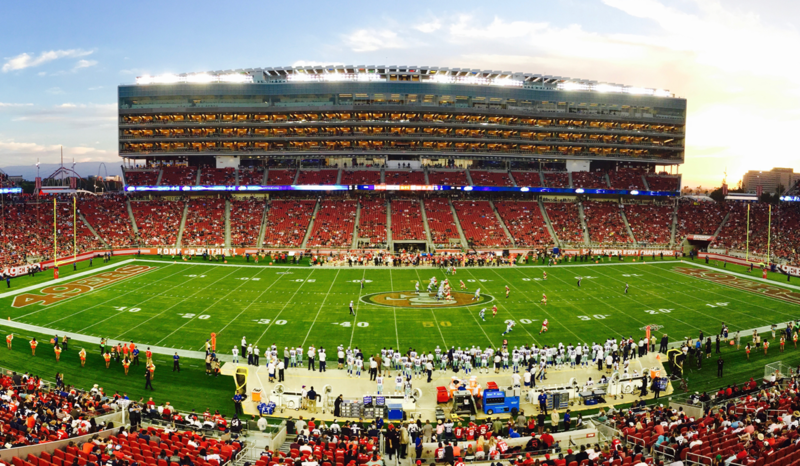 The San Francisco 49ers launched their debut fan engagement program called “The Home Field Advantage Plan” at a 2013 game against the Seattle Seahawks in an effort to present a unified front against their rival. The plan was essentially a mandate that told fans how to dress, when to arrive, what to chant, and when to cheer. Fans found this decree demeaning, and the resulting effect was the opposite of what was intended. This game presentation team was trying to craft an exciting fan experience, but they overproduced the event and prevented their fans from enjoying themselves. 3. Are Sharks Supposed to Fly? Every sports team is backed by a fearless mascot, but some might be a little bit too fearless for their own good. In March of 1999, the San Jose Sharks planned to kickoff a Friday night game with their mascot Sharkie propelling down from the rafters. Unfortunately, the rope that Sharkie was swinging from got stuck under his jersey, and he was not able to make it down on to the ice. The game was delayed for 20 minutes before the catch of the day was finally set free. New Orleans always grants its visitors a great time, and the 2013 Super Bowl was no exception until the Superdome went dark immediately following Beyoncé’s half time set. Fans across the country were confused by what they saw on their televisions, and officials in New Orleans were confused by what actually caused the outage. The blackout lasted for 10 minutes, and to this day no one knows for sure what caused it. Fireworks are guaranteed to be an exciting addition to any sporting event, but in 1994 the San Antonio Spurs created more excitement than they expected when they set off fireworks indoors. The entertaining explosives triggered the stadium’s sprinkler system, causing a massive flood that delayed the game for almost an hour. Luckily, fans were not outraged and took this as an opportunity to have fun. Many were sliding down aisles and jokingly opening umbrellas indoors. The Super Bowl isn’t the only national championship that has been subject to power outages. During the 1988 Stanley Cup Final between the Boston Bruins and the Edmonton Oilers, Boston Garden was without power for most of the game. The game presentation team had to evacuate all of the fans, but the game continued with the help of backup generators. By the end of the game, temperatures had risen to 80 degrees and the ice was creating clouds of fog that made it even more difficult for players to see. Game 3 of the 76ers-Celtics’ second-round series in the 2018 NBA playoffs was full of surprises. The game was shaping up to be a 76ers home game win, but the Celtics came back and made it a tie game with only 1.7 seconds left on the clock. The game was pushed into overtime, but confetti was released from the ceiling as if the 76ers had won. Clearly someone on the game presentation team got the wrong cue. While some game presentation mishaps can’t be avoided, many can be prevented or resolved with the right tools and processes in place. Static game scripts created in Excel make it extremely difficult to account for mishaps and can even cause them (like the confetti incident). Game presentation teams need to be able to adjust for the unexpected. Shoflo is a more dynamic game script creation tool that allows you to make edits and send updates in real-time as the game progresses. With Shoflo, your game presentation team will be better equipped to handle any game day mishap that comes their way.